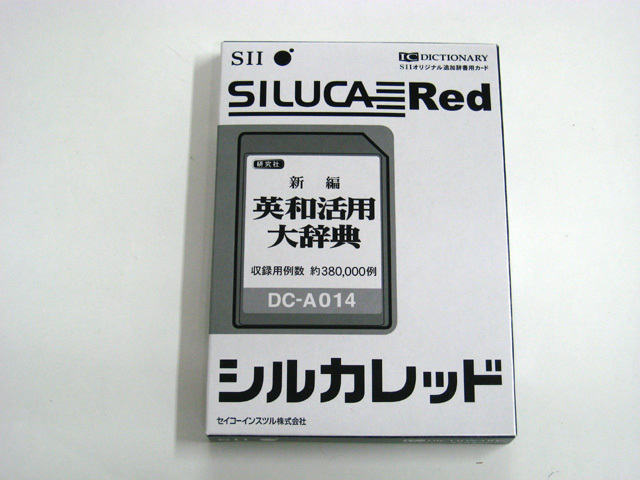 I bought an additional card called "English-Japanese Utility Dictionary"(SILUCA Red DC-A014）,which is for SR-ME7200 that I bought before. The Electronic dictionaries made of Seiko Instrument Inc.(SII) including SR-ME7200 are more solid than other company's in point of English dictionary,but since I came to write my blog,I came to feel that actual examples in English are few.Thus,I was led to buy this additional card with about 380,000 words. In the "English-Japanese Utility Dictionary",about 38 ten thousand sample sentences are discribed in order to be able to write natural sentense in English like the letter,article and translation,etc.And all of sample sentences are with Japanese translation.Idiomatic co-location between word and word is discribed very plainly.Examples in English are much more anyway,and it's likely to help me to write the correct sentence. To tell the truth,I really wanted "New Japanese-English Dictionary",but maybe this dictionary isn't sold from SII at the present.Though there are electronic dictionaries installed "New Japanese-English Dictionary",I'm sorry that it isn't put on the market as a card unit. CASIO Inc. put it on the market as a Contents Card,though.I want it to be released from SII someday. 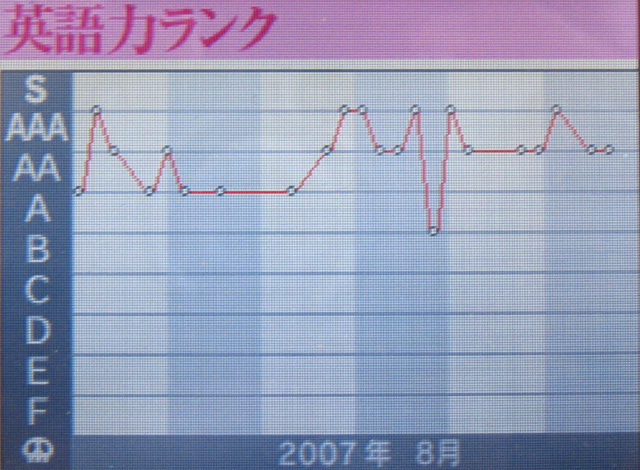 By the way,to change the subject, but I will report the result of "Motto Eigozuke" for August. The following is last month's(July) result. 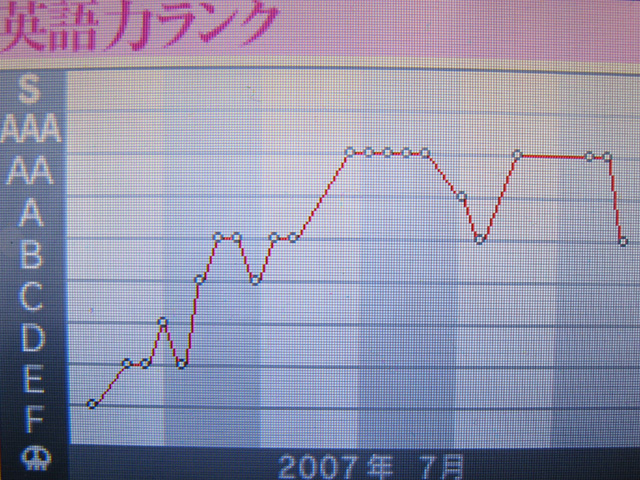 As compared with last month,I have come to be able to catch English considerably,but I haven't reach at all to the level that can be understood immediately once I listen.Even so,I think that the fruit has appeared through getting the "AAA" rank as many as six times which I couldn't get even though I did the best. But because I had heard that T teacher's rank was normally "S" and sometimes "AAA" in case of mistake,I haven't been satisfied with my ability at all.I'd like to get to the level of T teacher.These days,as time is taken only writing,I have the tendency to neglect hearing.Therefore,I would train in "Motto Eigozuke" and Screeplay this month,and I hope that I would come to be able to get "S" rank. Though my way is far long,I will keep studying english from now on.Aim for bilingual! !